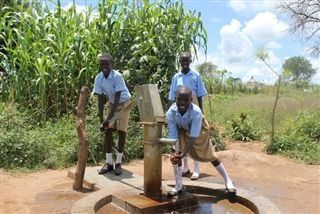 The New Generation Primary School in South Sudan is the proud recipient of a new well, thanks to Pacific Ridge 7th graders and those who supported the students' fundraising efforts. The New Generation Primary School in South Sudan is the proud recipient of a new well, thanks to Pacific Ridge 7th graders and those who supported the students' fundraising efforts. The students exceeded their $3,650 goal so quickly thatH20 For Life's implementing partner was able to start and complete the project early. The new well will provide New Generation Primary and its community with easy access to fresh, clean water. Patty Hall, H20 for Life founder, had this to say about Pacific Ridge's contribution: "What your students are providing is life saving and live changing. We appreciate your support, and the recipient school will forever be grateful."